Thanks to your feedback, Swimia has become in just a number of months one the most important web-sites of swimming pools. 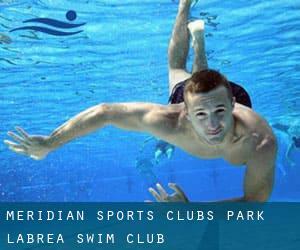 Here you have all of the info we know about Meridian Sports Clubs - Park LaBrea (Swim Club), in Los Angeles. Do you realize the opening hours? Are they offering any course? What is the cost for a single swim? Don't neglect you can also promote this pool so Meridian Sports Clubs - Park LaBrea (Swim Club) will appear the first of Los Angeles, or even the very first of your country, contact us to know more. Swimmers like you reported 25 yards x 25 feet, Salt Water, Outdoors. Unfortunately we do not have the email address of this Pool, but we can give you the phone number. Park on 6th Street and walk to facility. If you believe that any on the data is incorrect, please get in touch with us. Help us be better day-by-day. Updated on 2019 7900 Loyola Boulevard , Playa Vista / Marina del Rey , Los Angeles , CA , USA (Postal Code: 90045). This sports center provides Olympic size x 25 yards, 5 feet - 9 feet depth, Outdoors. Updated on 2019 1914 S. Bundy Dr. , West L.A. / Bundy , Los Angeles , CA , USA (Postal Code: 90025). Swimmers like you reported 20 meters, Indoors. Unfortunately we do not have the e-mail address of this Swimming Pool, but we can provide you with the phone number. Updated on 2019 7630 Towne Ave. , Southeast L.A. , Los Angeles , CA , USA (Postal Code: 90003). This sports center offers 25 yards, Indoors. Contact information and facts for this Swimming Pool like phone number and email address are number. Updated on 2019 1553 Schrader Blvd. , Hollywood , CA , USA (Postal Code: 90028). Among all the activities offered by the center, if you're thinking about swimming you are going to enjoy 20 yards x 40 feet, 6 lanes, Indoors. If you need to contact this Swimming Pool, email address and phone number are both number. Updated on 2019 2025 Avenue of the Stars , Century City , Los Angeles , CA , USA (Postal Code: 90067). Among all the activities offered by the center, if you're considering swimming you might get pleasure from 20 yards x 30 feet, Outdoors. Just in case you would like to get in touch with this Swimming Pool before dropping by, we only know the phone number. Updated on 2019 6833 Park Terrace , Playa Vista / Marina del Rey , Los Angeles , CA , USA (Postal Code: 90045). Among all the activities provided by the center, if you are thinking about swimming you'll take pleasure in 25 meters, Indoors. Just in case you would like to contact this Pool before dropping by, we only know the phone number. Updated on 2019 11336 Corbin Avenue , Northridge , CA , USA (Postal Code: 91326). Swimmers like you reported 25 meters, 6 lanes, 3.5 feet - 5 feet depth, Indoors. Phone number and email address are number for this Swimming Pool. Updated on 2019 9900 S. Vermont Ave. , South L.A. , Los Angeles , CA , USA (Postal Code: 90044). Among all the activities offered by the center, when you are interested in swimming you'll appreciate 25 yards, Indoors. Just in case you want to get in touch with this Swimming Pool before dropping by, we only know the phone number. Updated on 2019 545 South Figueroa Street , Downtown , Los Angeles , CA , USA (Postal Code: 90071). This sports center provides 20 yards, 3 lanes, Indoors. For this Swimming Pool, only phone number is number here. Updated on 2019 120 Westwood Plaza , UCLA Campus , Westwood , Los Angeles , CA , USA (Postal Code: 90095). Swimmers like you reported 25 yards, 6 lanes, Outdoors. Unfortunately we do not have the email address of this Pool, but we can give you the phone number. Updated on 2019 3560 Watts Way , USC , Los Angeles , CA , USA (Postal Code: 90089). This sports center delivers 25 yards, 8 lanes, 4 feet - 10 feet depth, Indoors. For this Pool, only phone number is number here.